WizKids will release its card and dice game Europa Base Alpha this June. 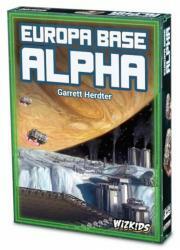 In Europa Base Alpha, each player is responsible for building up their nation’s network of moon bases in an arms race with the other players. They must build missile silos, bunkers, and other installations by rolling specific combinations of icons on the dice. The players also have cards that they can play to help their dice rolling or hinder the actions of their opponents. At the end of the game, the player with the most valuable base network wins the game. The game was created by Garrett Herdter (Miskatonic School for Boys), and is intended for 2 to 4 players, ages 14 and up. It includes 36 dice, 92 cards, 4 player boards, and tokens. An expansion called Invaders is also included in the box. Playing time is about 45 minutes.